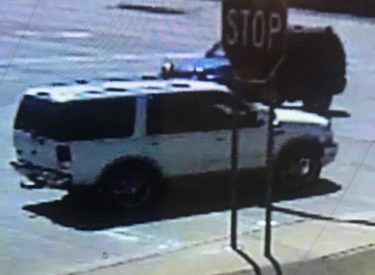 The Texas County Sheriff’s Department and the Texhoma Police Department are asking for assistance from the public in identifying the vehicle in the photograph. The vehicle was used in an armed robbery of an elderly woman in Texhoma, Oklahoma on May 25, 2018. This vehicle was last seen leaving Texhoma, Oklahoma traveling westbound on US Highway 54. The vehicle description is a White older model, possibly Ford Expedition with larger wheels. No tag information is available. If you see this vehicle or have any information please contact the Texas County Sheriff’s Department, the Texhoma Police Department or your local law enforcement agency. Occupants are believed to be armed and dangerous.